A new form of competition was added to the ANKC Rules in 2008. It is called Track and Search. It has been very popular among dedicated handlers and the success rate so far has been very high. Not all dogs or all handlers continue on after Tracking but those who do really enjoy it. 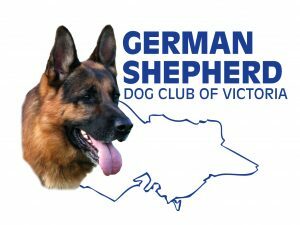 Currently it is possible to achieve three titles; Track and Search Dog (TSD) and Track and Search Dog Excellent (TSDX) and Track and Search Dog Grand Champion. 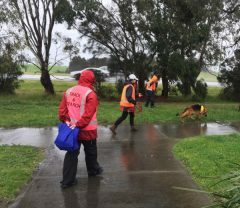 The tests are meant to be as close as possible to a real life situation where a dog is meant to find a missing person in varying terrain. Various surfaces including gravel, sand, paved surfaces, timber decking and dirt and asphalt roads are used. Ordinary grass and pasture can be used, but 25% of the track for Tests 1 to 4 must be laid on surfaces other than plain grass. Test 5 and 6 are laid in suburban streets and the track is substantially on paved footpaths. Tracks are also meant to meander rather than continue in straight lines as in traditional Tracking. 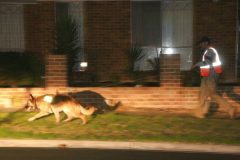 Also unlike traditional Tracking, tracks can be laid in contaminated areas where the public and other animals may be encountered. Tracks also vary in complexity with differences in length, time delays and numbers of diversions and cross tracks. 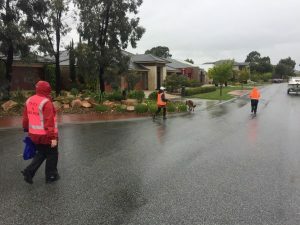 For the earlier tests, the handler has the choice of starting the dog on or off lead and then attaching the line to the collar once the dog has found the scent. The dogs also should find articles that someone might have lost in real life eg. Mobile phone, notebook, toy, wallet or anything that can be imagined that is small and harmless to all. There are also cross tracks and diversion tracks, sometimes where two people start off together and one walks off in a direction that is different from where the tracklayer has gone. Judges always give the handler a description of who they are looking for. The descriptions can be very entertaining indeed. 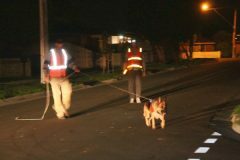 Our handler/dog teams have looked for drunks who have lost their way home, grannies who have escaped from nursing homes and in one case, a Russian spy. 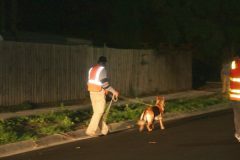 The later tracks are held in streets where cars and pedestrians and dogs and cats must be negotiated. 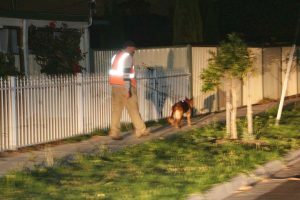 The final track to gain the title of Track and Search Dog Excellent is held in the streets at night. Always good fun on rubbish bin night! 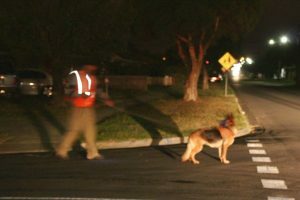 The night track is always a spectacle with judges, helpers, handlers and dogs decked out in safety gear and headlamps. 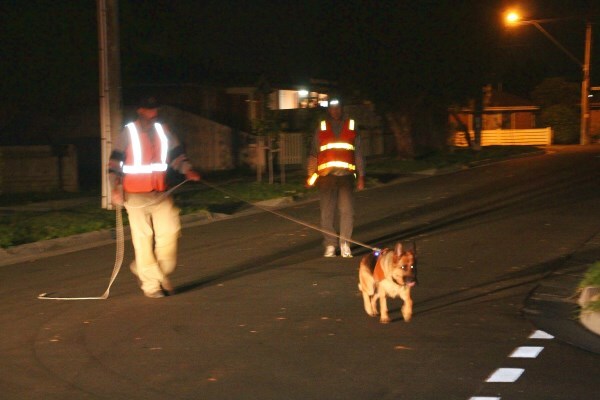 Some people are very creative and have flashing lights on collars and lines. Safety is very important so everyone must be visible. 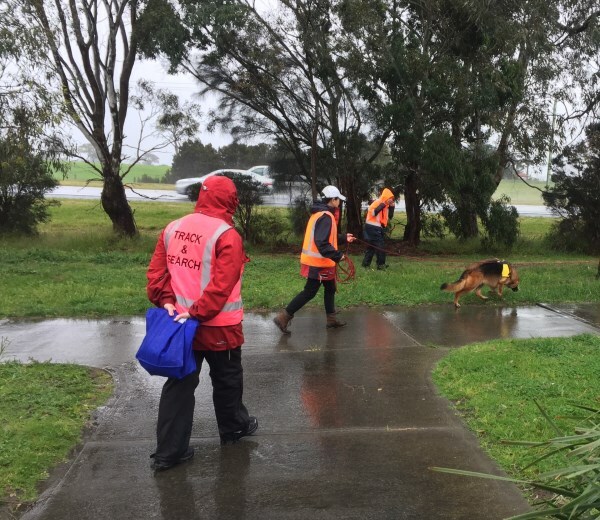 Track and Search does take a lot of training, like most disciplines. As in Tracking, the dog already knows how to track. You are only teaching him how to follow the scent you want him to follow. 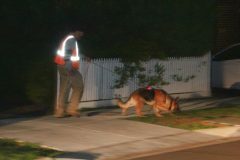 In Track and Search this is very important as the dog has to differentiate between various tracklayers and find the one whose scent he has been given at the start. This very complexity is what makes the dog so interested in this form of tracking.